Living Online: How To Update Your Hotmail To Windows Live Mail? How To Update Your Hotmail To Windows Live Mail? I read a blog which talk about how to update hotmail to Windows Live Mail without invitation.I know you can apply here for that email service but you still need waiting a long time for get an invitation. If you have an account of hotmail you can do some steps below for update hotmail by yourself (no guarantee).Before you do that, make sure you need use IE browser. 1, You need sigh in first.Maybe you need change your address which you registered to USA. 2, Copy this address to your browser address bar. 3, Click "go",that is all. 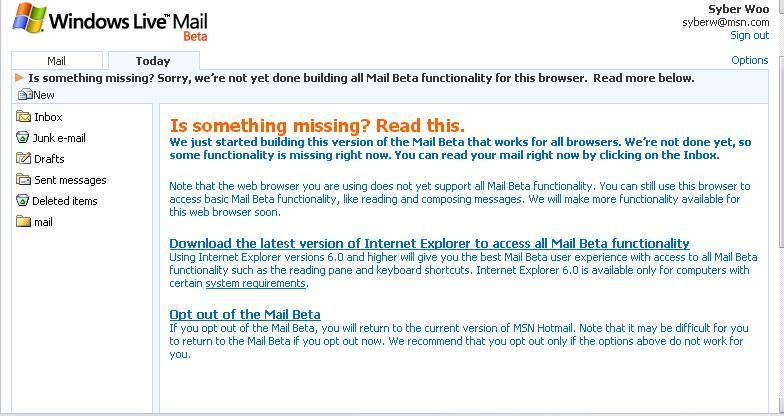 After you do this you will see your hotmail convert to Windows Live Mail.I did once time I got, but I can not use it. I don't know why, everything seems good but something wrong which I don't know.I switch to Opera browser to login my MSN account,it also works but Windows Live Mail does not support Opera.